The 2011 documentary This Is Not a Film by Jafar Panahi, a respected Iranian director, is compact in length but rich in content. Mr. Panahi was charged by the Iranian government with anti-government propaganda in 2010 and was put in house arrest, was banned from filmmaking, giving interviews or leaving the country for twenty years and additionally was sentenced to 6 years imprisonment. Producing this documentary was a distraction for Mr. Panahi while he was under house arrest and awaiting news of appeals that could save him from incarceration. The documentary was eventually smuggled out of Iran on a USB drive within a cake and sent to the Cannes Film Festival to avoid confiscation by the government. What unfolds throughout the course of 75 minutes is a day that Mr. Panahi spends confined within his apartment. A still-vital director barred from practicing his art can become restless and disillusioned, which is very evident from his actions. Mr. Panahi is seen eating breakfast, listening to phone messages from family, and speaking to his lawyer on the phone while obviously bored and frustrated by his circumstances. He convinces a friend to visit and they decide to surreptitiously film Mr. Panahi reading his banned screenplay within his apartment. The lost hope of an appeal or reduced sentence leads Mr. Panahi to seek an artistic outlet, despite the consequences. 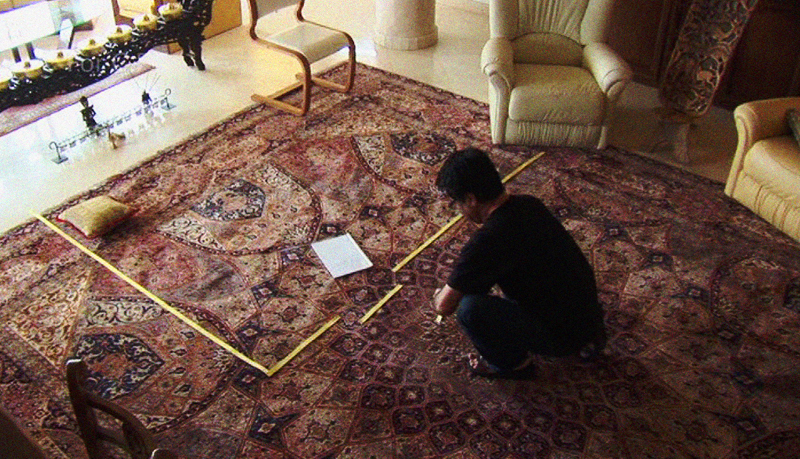 A documentary featuring a director analyzing the work of his amateur actors or mapping out the parameters of a scene on a rug with tape is enlightening, but in this instance, it is a desperate attempt by the constrained director to keep his sanity. He is on screen almost constantly and speaks at great length about his past work and the work that is not to be. The distress and loneliness Mr. Panahi experiences from his house arrest leads him to nearly cling to the few visitors he receives. It is a bleak statement on how a dream deferred can lead a strong, creative man to grasp at strings. For a film of such short length, the flow and storyline are incredibly well conceived. A serene shot from within the apartment of a crane is particularly stunning as well as a fireworks festival that occurs on the evening of filming. There is also a good bit of humor within this film, which lifts the mood mercifully. An encounter with a janitor towards the end of the film is a scene of serendipity which seems almost staged. Regardless of the veracity of this meeting, the dream of free artistic expression is well expressed through this occurrence. The documentary leaves one feeling as powerless as Mr. Panahi; the absurdity of a government imprisoning an artist with trumped-up charges is unjust and ultimately does not help culture flourish in a society that is yearning for free expression.